Manage Subscriptions is the step between Generating a Subscription for a Member and an Unpaid Transaction being created in the Member's Account. This step allows you to double check that you have assigned the correct Subscription Types to each Member before finalising the Unpaid Transaction. 1. Within the Management Console, select Subscriptions from the top menu, then Manage Subscriptions from the left menu. 2. 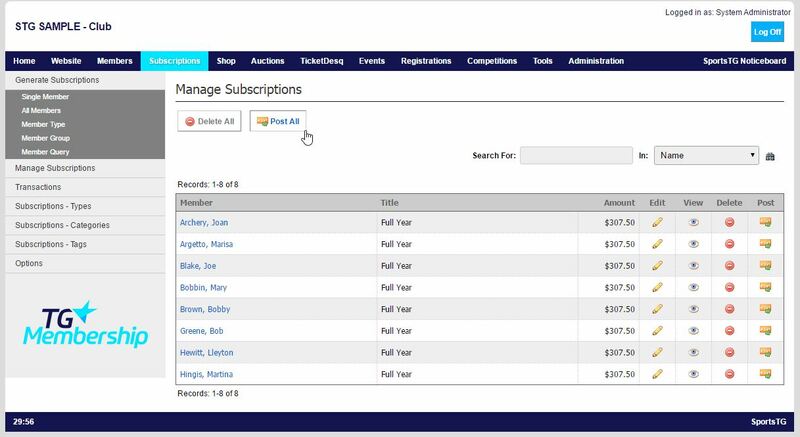 Here you can view a list of all the members with generated subscriptions, as well as the Subscription Type that has been assigned to that member. You can click on the member's name to view their Member Record and ensure that this corresponds with their Default Subscription Type. 3. Once you are happy with the generated subscriptions, you can either click Post All at the top of the screen, or Post next to each individual member. 4. This will send the generated Subscriptions into Transactions > Unpaid to be paid by the member either through the Members portal, or through the club. Note: Manage Subscriptions allows you to ensure that subscriptions that have been created in bulk are all correctly assigned to each member before posting them for members to be able to log in and make payment.